To those who grew up through the 1980s and 1990s such as myself, there was a triumvirate of individuals that stood out as the most established and accomplished of writers in the realm of political thrillers. These individuals were Tom Clancy, Frederick Forsyth, and Robert Ludlum. In all of Mr. Ludlum’s properties, perhaps the one that is most notable at the moment is that of the Bourne saga. Two previous movies that were based on the license were huge hits that I, on my part, enjoyed immensely. The third movie that opened this weekend in our nation’s cinemas may be one of the most hotly-anticipated films of the year. In anticipation of the then forthcoming movie, I decided to keep myself abreast with the story by reading this book. To be frank, however, I was never a huge fan of political thrillers and am new to Mr. Ludlum’s books. I much prefer works in the psychological vein such as those by Patricia Highsmith, or Ruth Rendell. I also found out much later, the now well-known fact that the movie will not be based on the book. Keeping that in mind, those who are interested in the book merely as a movie tie-in may well be disappointed. The Bourne Ultimatum starts off with a bang; with an attack that makes it clear to Jason Bourne that the past is catching up with him. Thirteen years ago, there was a conflict between Bourne and Carlos, an expert assassin that is also known as the Jackal. That conflict ended with Bourne triumphant, and Carlos almost losing his life. Now, Carlos is back for revenge, and targeting those who are closest to Bourne. In order to counteract Carlos, Bourne has to craft a bold plan by using Medusa, a secret organization from his past, to lure Carlos into a final showdown and end the strife forever. In between, the plot is kept moving through plot points such as an attempted assassination on Bourne’s family; an uncovering of a new, corrupted and sinister scheme within the government; as well as confrontations in Paris and Moscow. In researching Mr. Ludlum’s background, I found that he had previous experience in the theatrical industry. In my opinion, though, this only sometimes shows in the plot. The rivalry between Bourne and Carlos is potentially gripping, but tends to drag later on due to repeated close but failed attempts on Bourne’s part to track down Carlos. Where Mr.Ludlum succeeded is in the scope of the story. The aforementioned corruption in the government reaches heights that are daring, and the story’s events span the whole globe from America, to France, and on to Russia. The details of the conspiracies and the technicalities of the conflict are of such a painstaking nature, that it will either send the reader into fits of rapture or into frustration. For myself, the deluge of details and immense number of characters causes the story to be confusing at times. This is further aggravated by Mr. Ludlum’s somewhat excessive favoritism of pronouns. Overall, though, the plot is serviceable. The dialogue and characterization, on the other hand, is a different story. Major problems in the dialogue include an artificial quality and an extravagant usage of pronouns. There is also an annoying habit in using italics as an emphasis to tell, instead of showing key points in the conversation. The artificiality of the dialogue affects the characters, and due to the shortcoming, many come across as one-dimensional or stereotypical. This is a serious drawback as it reduces the empathy the reader feels towards them. The Bourne Ultimatum is an acceptable political thriller. All the ingredients that I understand to be trademarks in a Ludlum work are present and accounted for. The plot is at times suspenseful, there is a strong sense of drama throughout in the conflict of forces, and the details that Mr. Ludlum placed in the composition of the work are meticulous. I have to be blunt, however, in saying that the book is not exceptional, and personally, did not do much for me. All the problems discussed above are major ones. My appraisal of the book may be somewhat biased by my unfamiliarity with a Ludlum work. The research I have done on other people’s opinion of the book has however shown my judgment to be pretty universal. Ultimately, no pun intended, my opinions about the book will not matter a whit if you’re already an established fan of Mr.Ludlum. The book is certainly important in that it offers somewhat of a closure to the Bourne narrative, even more so as it was the last Bourne book ever written by Mr. Ludlum himself. For the rest of us, however, whether you read the book is a personal choice you have to make. 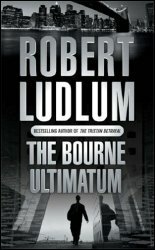 With Matt Damon expressing interest in playing Jason Bourne a third time, Universal Pictures has signed Tony Gilroy to adapt Robert Ludlum's The Bourne Ultimatum.